An expedition led by Microsoft co-founder Paul Allen aboard his mega-yacht Octopus has been forced to abandon their efforts to recover the ship’s bell of the Royal Navy battlecruiser HMS Hood. Allen and his team have been operating out of Reykjavik, Iceland for the last two weeks, but a combination of weather and mechanical issues with their ROV have caused the team to end its efforts on the Hood this recovery season. Named for Admiral Samuel Hood, the Hood was the second ship to bear his name. The ship entered service in 1920 and is best known for its role in the hunt for the German battleship Bismarck. 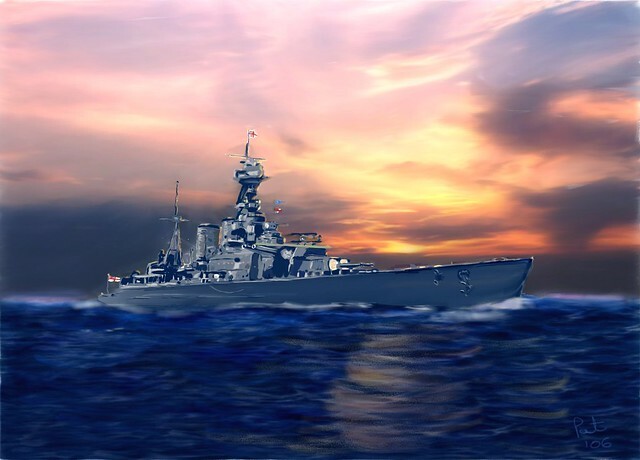 HMS Hood and the battleship HMS Prince of Wales intercepted the Bismarck on May 24, 1941 as the Bismarck and heavy cruiser Prinz Eugen attempted to break out into the North Atlantic in hunt of British merchantmen. In a running battle lasting less than 20 minutes, the Bismarck sank the Hood and damaged the Prince of Wales. The Hood took with it 1,415 of her 1,418 man crew. The engagement became known as the Battle of the Denmark Straits and was merely the opening act of a massive 3 day manhunt culminating in the sinking of the Bismarck on May 27th. The Prince of Wales went on to serve in the Pacific Theater where it, along with the battleship HMS Repulse, was sunk by a Japanese air attack. Prinz Eugen survived the war and was later used as a target ship by the US Navy for atomic bomb tests.